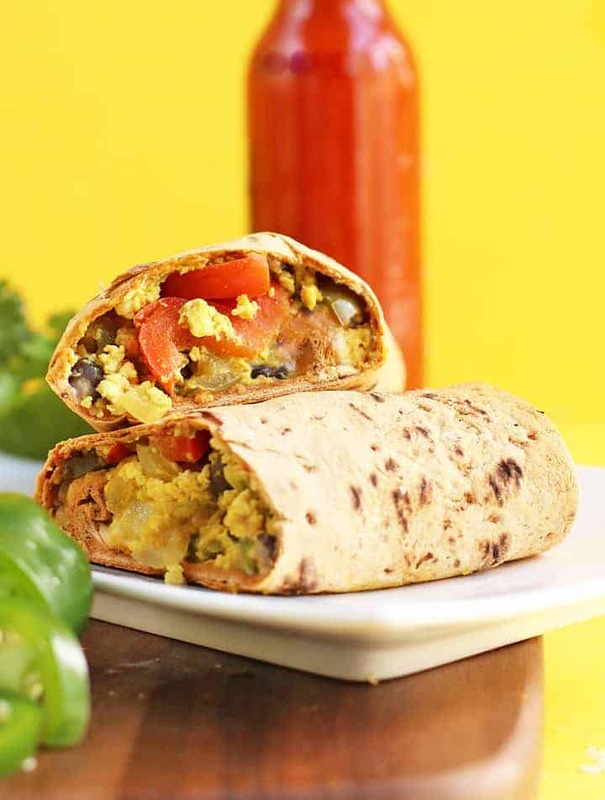 This Southwest Vegan Breakfast Burrito is loaded with protein and vegetables and filled with flavor for a healthy, delicious breakfast. Make the vegan scrambled eggs according to these directions. Once done, transfer to a bowl and set aside. In the same skillet, heat 1 tablespoon of coconut oil. Add onions and sauté for 5 minutes, until tender and fragrant. Add garlic and red and green peppers, and continue cooking for another 5-7 minutes until peppers are tender. Add green chiles, cumin, black beans, and lime juice. Cook for about 3 more minutes. Stir in vegan scrambled eggs and remove from heat. Evenly divide the filling between the 6 wraps. Sprinkle with non-dairy cheese and roll up. Serve immediately. To freeze, let cool completely then wrap in tin foil and freeze for up to 4 weeks.